The walls of the chancel bear several memorial tablets to this man and his family, who lived at Thorpe Hall from the 18th until the early 20th century. Stephen Martin Leake was born Stephen Martin, the son of a naval officer. He was a numismatist who served for many years at the College of Arms, rising through the ranks to become Garter Principal King of Arms, the highest position in the college. With the Dean of Windsor, he brought the registers of the college up to date and is credited with greatly improving the way the College of Arms operated, his lasting legacy. Catherine or Kitty Canham was the daughter of a yeoman farmer of Beaumont. She married the Reverend Alexander Gough, the vicar of Thorpe-le-Soken, who was apparently very much her senior. Kitty used to spend some time in London and there one day she met Viscount Dalmeny, heir to the Marquis of Rosebury. There are several versions of this story but all agree that they married and went to Italy where Kitty died of consumption. On her death bed she confessed that she was the wife of the vicar of Thorpe-le-Soken and said that it was her wish to be buried in Thorpe churchyard. The heartbroken nobleman brought her body home as she requested (in a barrel of brandy) but the boat got into trouble in a storm and pulled into the nearest safe port - the Hythe at Colchester. There her body was kept for three weeks in *St Leonards church until it could be identified. Then it was brought back to Thorpe and it is said that the two husbands walked side by side in the funeral procession from the old vicarage. William Withey Gull was the son of a barge owner and wharfinger. Born aboard his father's vessel The Dove, William was baptised at the sailor's church, *St Leonard's, Hythe, Colchester where, more than half a century earlier, Kitty Canham had lain awaiting identification. The family moved to Thorpe when Gull was 4 years old and lived in the hamlet of Landermere. From those modest beginings William Withey Gull went on to be one of the foremost physicians in England. He became Physician in Ordinary to Queen Victoria, and is remembered for his very considerable contribution to medical knowledge. He it was who gave 'Anorexia Nervosa' its name and treated it with some success. He advanced the understanding of several other diseases including Myxoedema, Paraplegia and Bright's disease. Gull was also a champion of women in medicine. In the 1970s he became associated by crime authors / conspiracy theorists with the so-called 'Jack-the-Ripper' murders. For some of these theorists he is a conspirator with members of the royal family, for others he is Jack-the-Ripper himself. Sir William Gull is not the only one of Queen Victoria's doctors to have suffered this posthumous accusation, another being Sir John (Jack) Williams who was the royal obstetrician, a Welshman who left his considerable fortune to found the National Library of Wales. There is, however, no real evidence that either of these emminent physicians did anything wrong. and to love mercy and to walk humbly with thy God." James Rolph son of Jonas and Elizabeth Rolph was a member of a wealthy farming and landowning family who lived at Thorpe Lodge which James inherited from his elder brother. He built and endowed Rolph Church of England Primary School, gave a considerable sum of money for the rebuilding of the parish church which he did not live to see and left various legacies to worthy causes. He is commemorated by the Rolph Window in the west wall of the south aisle (in the Community Room). This world famous author was born at Hanley, Staffordshire in 1867 and died at his home in Baker Street, London in 1931. From 1913 until 1921 he and his French wife, Marguerite lived at Comarques in Colchester Road. Comarques had other French connections having been built by a Huguenot refugee, Captain John Comarques in 1720. During his time in Thorpe, Bennett was often seen walking the country lanes around the area. 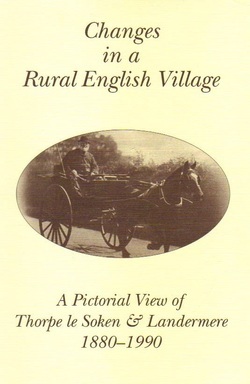 'Changes in a Rural English Village - A Pictorial View of Thorpe-le-Soken & Landermere 1880-1990' by village Recorder and Historian, Pearl Londsale. Copies are available from Saint Michael's Parish Church.